Aphrodite, the Greek goddess of love and beauty (Latin name: Venus), has been portrayed countless times in paintings throughout the world. Most famous, perhaps, is Sandro Boticelli’s, “The Birth of Venus,” which hangs in the Uffizi Museum in Florence, Italy. Less well-known, however, is the coastal town where the mythic belle rose from the waves. Paphos, a town rich in history and archaeological treasures, sits on the southwest coast of Cyprus and was, during Hellenistic and Roman times, the island’s capital. Besides birthing a voluptuous sea-maiden, Paphos played a very important part in the spread of Christianity. It was here that Saint Paul the Apostle converted the first Roman ruler to the faith in 45 A.D. Ayia Kyriaki Chrysopolitissa church in Kato Paphos, sits among the 4th century ruins of one of the oldest Christian Basilicas in the world. It was in this location that Saint Paul is said to have received his 39 lashes. The present day church was built in the Byzantine style by the Venetians who took control of the island in 1498. 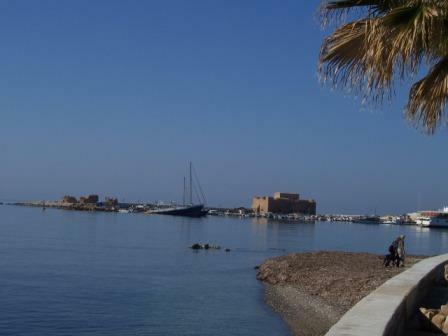 Paphos (the whole of Nea Paphos i.e. Kato Paphos) and Paleapaphos (Old Paphos i.e. Kouklia) was granted a World Heritage Listing in 1980 and the creation of the Paphos Archaeological Park took place. Having a World Heritage Listing means that each listed site is considered a cultural and national treasure and it is in the interest of the international community that each site be preserved. The Archaeological Park includes many spectacular sites such as the Houses of Dionysos, Theseus and Aion (famous for their incredibly beautiful mosaics which can be appreciated not only from a historical point of view but also for the incredible artistic talent that went into creating works of such beauty). Also included are the House of Orpheus, the House of Four Seasons, the city’s old Roman Odeion, the Hellenistic necropolis ‘Tombs of the Kings’, the ancient Agora, Saranta Colones Fortress, Asklepieion (a sanctuary dedicated to the God of Medicine), Limeniotissa (ruins of an early Christian basilica dedicated to Our Lady of the Harbour), an ancient theatre constructed in approximately 300 B.C. and which is currently under excavation by archaeologists from the University of Sydney, Australia and, lastly, the sanctuary in Kouklia of the mythic belle, Aphrodite, goddess of love and beauty, where the ancient ruins date as far back as the 12th century B.C. Recently in Fig Tree Bay, Protaras, ancient tombs were discovered intact during preparations for the construction of a new building. As the new District Court in Paphos was being built some years ago, workers uncovered urns and other artifacts as they dug below the surface to prepare the foundations. This type of find happens frequently in Cyprus. It seems that almost everywhere you tread in Paphos you are walking above a trove of archaeological treasures.